Nettle tea is regarded as a healthy drink. It might aid treatment for a variety of health conditions, both those supported by scientific research and those touted in natural healing and alternative medicine. Before you brew a cup of stinging nettles, it's important to know what it can treat and whether it's a good herbal tea for you. Nettle tea is an herbal "tea" made from the leaves and roots of the stinging nettle plant. Nettle tea is an infusion or decoction, depending on how you prepare it. It is often considered to be one of the best herbal infusions for overall health and wellness. Nettles can be boiled or steeped on their own or added to herbal blends with herbs like raspberry leaves, lemon balm, peppermint, lemon peel, vervain, and alfalfa. On its own, nettle tea has a herbaceous, rich taste that some compare to an earthy, sweet version of seaweed. The stinging nettle plant (Urtica dioica) is the best known of the family of nettle plants, also known as the genus Urtica in the family Urticaceae. At first glance, they may not seem like an ideal herbal infusion. In addition to being a popular food amongst caterpillars and butterflies, they bear needle-like points which are extremely irritating to the skin. However, stinging nettles make a fantastic tonic herb and culinary herb and can be used as an ingredient in everything from pasta dishes to soups and stews to herbal teas and tonics. Nettle leaves and roots may be used topically as a powder or juice, or be consumed in food, beverage, or supplement form. Generally, one teaspoon of fresh or dried nettle per cup of tea is a good ratio, though some people use up to four teaspoons of dry leaf per 2/3 cup water. For a stronger infusion, you can crush the leaves with a mortar and pestle just before adding the water. For a regular infusion, nettle tea can be steeped five to 20 minutes with water that has reached a rolling boil. It can also be boiled for a few minutes and then strained for a decoction. You can also steep it at room temperature overnight for a strong tonic. A maximum dosage of four cups a day is recommended. Nettle was used in ancient Greece and Rome. In Medieval Europe, nettle was considered a panacea of sorts and used for all manner of ailments. Nettle tea is considered to be slightly laxative and warming. Today, it is often thought of as a superfood or super herb. 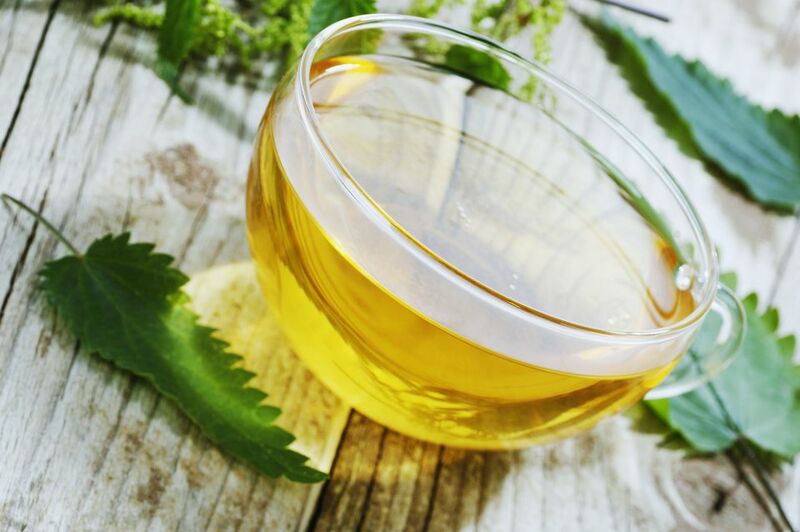 Nettle tea is high in many nutrients, particularly vitamin A, various B vitamins (including B-1, B-2, B-3, and B-5), vitamin C, amino acids, calcium, fatty acids, folic acid, iron, magnesium, manganese, phosphorus, and potassium. It also contains numerous phytonutrients and antioxidants, including acetic acid, beta-carotene, betaine, caffeic acid, and lycopene. For this reason, it is widely appreciated as a healthful drink. Stinging nettle root is used in treating benign prostatic hyperplasia, especially by European medical practitioners, and this is supported by research. Some studies demonstrate that nettle may have at least minor effects in managing and easing allergy symptoms, such as sneezing, congestion, itching, and inflammation. Beyond this, it is regarded as a general tonic and a detoxifying tea, particularly for those suffering from hangovers and those who are quitting smoking. Although nettle is generally considered to be safe and nontoxic, there are some side effects associated with its improper use. Side effects can include an upset stomach, skin irritation, skin rash, and sweating. It may also cause interactions with certain drugs. This list includes antiplatelet, anticoagulant, antihypertensive, blood pressure, a blood thinner, diuretic, diabetes, insomnia, non-steroidal anti-inflammatory drugs, and lithium. Side effects tend to be more common when the root is made into tea than when the tea is made from nettle leaves. The maximum recommended use of nettle tea is four cups per day. The consumption of nettle tea during pregnancy is controversial. It is often included in pregnancy tea blends, but it is listed as "likely unsafe" in the Natural Medicines Database. As with all herbal remedies, it is highly recommended that you consult with a doctor or herbalist before beginning treatment with nettle tea.